Please check the errata for any errors or issues reported since publication. Copyright © 2017 OGC & W3C ® ( MIT, ERCIM, Keio, Beihang), W3C liability, trademark and document use rules apply. The Semantic Sensor Network (SSN) ontology is an ontology for describing sensors and their observations, the involved procedures, the studied features of interest, the samples used to do so, and the observed properties, as well as actuators. 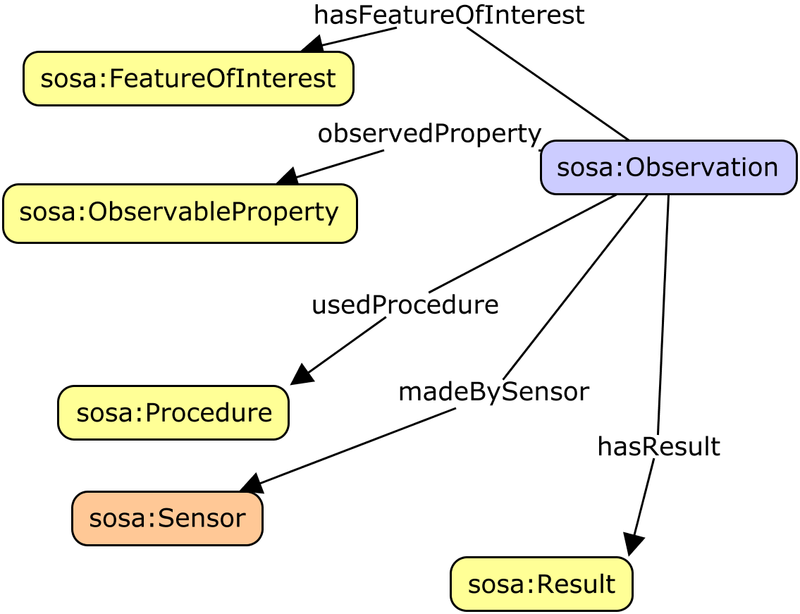 SSN follows a horizontal and vertical modularization architecture by including a lightweight but self-contained core ontology called SOSA (Sensor, Observation, Sample, and Actuator) for its elementary classes and properties. With their different scope and different degrees of axiomatization, SSN and SOSA are able to support a wide range of applications and use cases, including satellite imagery, large-scale scientific monitoring, industrial and household infrastructures, social sensing, citizen science, observation-driven ontology engineering, and the Web of Things. Both ontologies are described below, and examples of their usage are given. The namespace for SSN terms is http://www.w3.org/ns/ssn/. The namespace for SOSA terms is http://www.w3.org/ns/sosa/. The suggested prefix for the SSN namespace is ssn. The suggested prefix for the SOSA namespace is sosa. The SSN ontology is available at http://www.w3.org/ns/ssn/. The SOSA ontology is available at http://www.w3.org/ns/sosa/. Status update (December 2017): The following links were targeting wrong resources and have been fixed in-place: the link to the ontology graph in section 5.1, the link to the DUL namespace in section 6.1.1, the link to the SOSA to PROV alignment in section 6.5.1, and the link to the graph corresponding to the example in appendix B.11. Additional editorial errors noted in the errata document. This section describes the status of this document at the time of its publication. Other documents may supersede this document. A list of current W3C publications and the latest revision of this technical report can be found in the W3C technical reports index at https://www.w3.org/TR/. For OGC - this document was prepared by the Spatial Data on the Web Working Group (SDWWG) — a joint W3C-OGC project (see charter). The document is prepared following W3C conventions. At the time of publication, this document was in the approval process for the OGC Full standards track and thus its status in the OGC will be indicated in Discussion Papers or OGC Standards on the OGC website. Recipients of this document are invited to submit, with their comments, notification of any relevant patent rights of which they are aware and to provide supporting documentation. This document was published by the Spatial Data on the Web Working Group as a Recommendation. Comments regarding this document are welcome. Please send them to the GitHub repository. An archive of the mailing list is also available. Please see the Working Group's implementation report. This document has been reviewed by W3C Members, by software developers, and by other W3C groups and interested parties, and is endorsed by the Director as a W3C Recommendation. It is a stable document and may be used as reference material or cited from another document. W3C's role in making the Recommendation is to draw attention to the specification and to promote its widespread deployment. This enhances the functionality and interoperability of the Web. This document was produced by a group operating under the W3C Patent Policy. W3C maintains a public list of any patent disclosures made in connection with the deliverables of the group; that page also includes instructions for disclosing a patent. An individual who has actual knowledge of a patent which the individual believes contains Essential Claim(s) must disclose the information in accordance with section 6 of the W3C Patent Policy. This document is governed by the 1 March 2017 W3C Process Document. Sensors are a major source of data available on the Web today. While sensor data may be published as mere values, searching, reusing, integrating, and interpreting these data requires more than just the observation results. Of equal importance for the proper interpretation of these values is information about the studied feature of interest, such as a river, the observed property, such as flow velocity, the utilized sampling strategy, such as the specific locations and times at which the velocity was measured, and a variety of other information. OGC's Sensor Web Enablement standards [ OandM ], [ SensorML ] provide a means to annotate sensors and their observations. However, these standards are not integrated and aligned with W3C Semantic Web technologies and Linked Data in particular, which are key drivers for creating and maintaining a global and densely interconnected graph of data. With the rise of the Web of Things and smart cities and homes more generally, actuators and the data they produce also become first-class citizens of the Web. Given their close relation to sensors, observations, procedures, and features of interest, it is desirable to provide a common ontology that also includes actuators and actuation. Finally, with the increasing diversity of data and data providers, definitions such as those for sensors need to be broadened, e.g., to include social sensing. 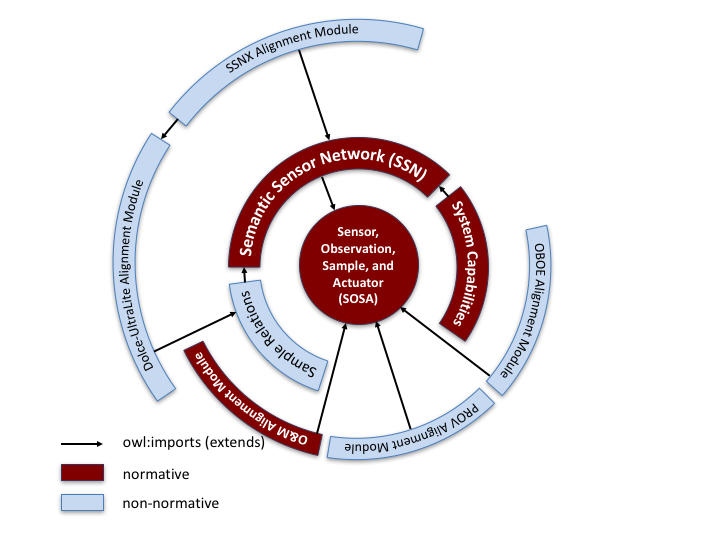 The following specifications introduce the new Semantic Sensor Network (SSN) and Sensor, Observation, Sample, and Actuator (SOSA) ontologies that are set out to provide flexible but coherent perspectives for representing the entities, relations, and activities involved in sensing, sampling, and actuation. SOSA provides a lightweight core for SSN and aims at broadening the target audience and application areas that can make use of Semantic Web ontologies. At the same time, SOSA acts as minimal interoperability fall-back level, i.e., it defines those common classes and properties for which data can be safely exchanged across all uses of SSN, its modules, and SOSA. Practitioners using the original Semantic Sensor Network Ontology as defined in the W3C Semantic Sensor Network Incubator Group [ SSNO ] have identified a major issue in its complexity, partly due to the layering underneath the Dolce-UltraLite (DUL) upper level ontology. In response to this, the new Semantic Sensor Network (SSN) ontology offers several ontology subsets that are distinguished mainly through their ontological commitments. This section explains the rationale and method for modularizing SSN, i.e., offering several distinct ontologies that are similar in their domain of discourse, but with different ontological commitments, suitable to several use cases and target audiences. For example, SOSA is intended to provide Schema.org-style semantic enrichment capabilities for data repositories managed by an audience broader than typical ontology engineers, while still ensuring interoperability with SSN-based repositories. Ontology modularization is a common method used in ontology engineering to segment an ontology into smaller parts. In general, ontology modularization aims at providing users of ontologies with the knowledge they require, reducing the scope as much as possible to what is strictly necessary in a given use case. Two main categories of ontology modularization can be distinguished. The first category comprises those approaches that focus on the composition of existing ontologies by means of integrating and mapping ontologies, most commonly through owl:import statements. 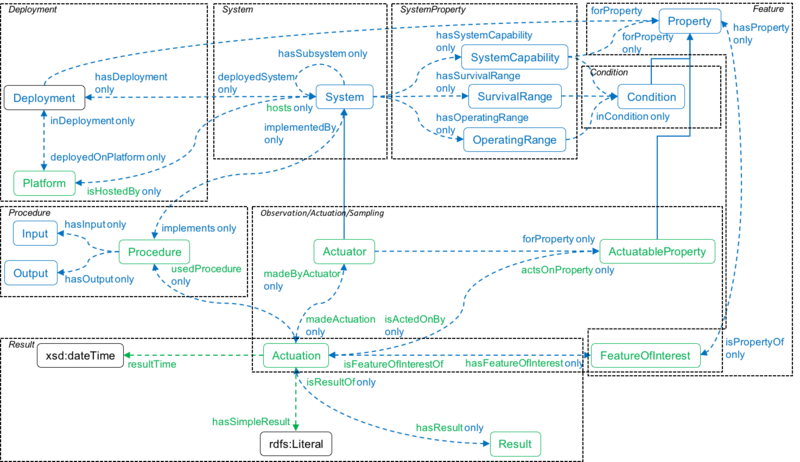 OWL import has a direction from a dependent ontology to a dependency ontology. Although import is transitive, knowledge is propagated in only one direction. The importing ontology assumes all the meaning of the imported terms used, by including all axioms relevant to the meaning of these terms. However, the imported ontology does not capture any of the semantics of the importing ontology. The second category comprises of mapping approaches that aim to partition and extract parts of ontologies as modules. These mapping approaches are not necessarily directional, but most approaches of ontology extraction rely on the directionality of the imported modules. The main feature of an ontology module under the second category is that it is self-contained, i.e., the module captures the meaning of the imported terms used by including all axioms relevant to the meaning of these terms. This means, that the result of certain reasoning tasks such as subsumption or query answering within a single module should be possible and result in the same answers without the need to access other modules of the ontology. Our modularization uses the first approach by composing the ontology into several modules that use owl:import statements, whereby we distinguish two methods depending on the directionality of the segmentation: a vertical segmentation and a horizontal segmentation. Figure 1 The SOSA and SSN ontologies and their vertical and horizontal modules. Vertical modules build upon each other, i.e., they directionally owl:import lower level modules. Lower level modules are independent of their higher level modules and logically consistent on their own. For example, the Dolce-UltraLite Alignment Module imports the SSN Ontology which itself imports the SOSA Ontology. However, in reverse, neither SOSA nor SSN import the Dolce-UltraLite Alignment Module. In fact, SOSA as the core, does not import any other ontologies, which makes it truly independent of vertical modules that add more expressivity and further ontological commitments to the lightweight semantics of SOSA. Note that higher level here is not to be confused with upper level ontologies. Upper level ontologies are general knowledge ontologies that can be directionally imported in many domains, whereas our definition of higher level ontologies here refers to an ontology that extends one or several ontology modules to capture a larger part of a knowledge domain and/or combine knowledge domains. Modules that are horizontally layered may depend on each other, i.e., they may rely on the directional import of another horizontal module. Only one horizontal module that is dependent on the SSN ontology is presented in this specification, the Sample Relations Module. Other ontologies that add domain-specific terms to SSN, but require the import of SSN, can be considered horizontal modules. Here we briefly review the origins of SSN and SOSA, namely the initial SSN version published by the W3C Semantic Sensor Network Incubator Group [ SSNO ] and work on Sensor Web Enablement by the OGC. We also highlight the most substantial changes made since the initial release of the SSN ontology. Starting in 2002, the OGC's Sensor Web Enablement initiative has developed a generic framework for delivering sensor data, dealing with remote-sensing, moving platforms, and in-situ monitoring and sensing. The Sensor Observation Service defines a standard query interface for sensor and observation data, following the pattern established by OGC for their Web Services. The returned XML data conforms with the Sensor Model Language [ SensorML ] and OMXML [ OMXML ], whereby the latter implements Observations and Measurements [ OandM ]. SensorML and O&M are complementary viewpoints. SensorML is 'provider-centric' and encodes details of the sensor along with raw observation data. SensorML is self-contained and highly flexible. This makes life easy for data producers but is demanding on consumers. SensorML provides extensive support for serialization of numeric data arrays and is particularly optimized for data that includes multiple parallel streams that must be processed together. For example, the data collected by cameras on airborne vehicles must be geo-referenced based on the instantaneous position of the platform and orientation of the camera. In contrast, O&M was designed to be more 'user-centric' with the target of the observation and the observed property as first-class objects. O&M works at a higher semantic level than SensorML, but only provides abstract classes for sensors, features of interest and observable properties, expecting the details to be provided by specific applications and domains. O&M also provided a model for sampling, since almost all scientific observations are made on a subset of, or proxy for, the ultimate feature of interest. 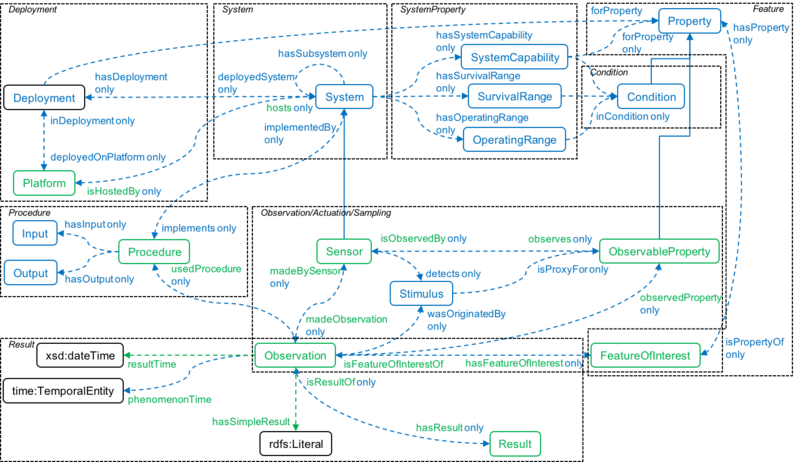 The initial W3C Semantic Sensor Network Incubator Group ontology (SSN) was built around an ontology design pattern called the Stimulus Sensor Observation (SSO) pattern [ SSO-Pattern ]. The SSO was developed as a minimal and common ground for heavy-weight ontologies for the use on the Semantic Sensor Web as well as to explicitly address the need for light-weight semantics requested by the Linked Data community. The SSO was also aligned to the Dolce-Ultralite upper ontology (DUL). The new SSN described in this document is based on a revised and expanded version of this pattern, namely the Sensor, Observation, Sample, and Actuator (SOSA) ontology. Similar to the original SSO, SOSA acts as a central building block for the SSN but puts more emphasis on light-weight use and the ability to be used standalone. The axiomatization also changed to provide an experience more related to Schema.org. Notable differences include the usage of the Schema.org domainIncludes and rangeIncludes annotation properties that provide an informal semantics compared to the inferential semantics of their OWL 2 counterparts. In line with the changes implemented for the new SSN, SOSA also drops the direct DUL alignment although an optional alignment can be achieved via the SSN-DUL alignment provided in Section 6.1. SOSA is also more explicit than SSO in its support for virtual and human sensor. Finally, and most notably, SOSA extends SSO's original scope beyond sensors and their observations by including classes and properties for actuators and sampling. SOSA also distinguishes between phenomenonTime and resultTime. Drawing on considerable implementation and application experience with SSN and sensor and observation ontologies more broadly, the new SSN and SOSA ontologies presented here are set out to address changes in scope and audience, shortcomings of the initial work, as well as new technical developments. The list below highlights the most important (but by far not exclusive) updates. The initial SSN was developed with ontology engineers in mind as the primary audience. Due to the widespread adoption of SSN, the increasing role of citizen science, the strong focus on lightweight vocabularies by the Linked Data community, and vocabularies such as Schema.org, the ontology was streamlined. SOSA is added as a core, and is also useful as a standalone ontology targeting Web developers, citizen science, lightweight Linked Data publishing, resource-constraint IoT devices, data intensive applications (with the possibility of using lightweight reasoning), and so on. The new SSN introduces additional classes and relations on top of SOSA to model the capabilities of sensors and actuators, the compositionality of systems, and so forth to suit more complex needs or cases in which more provenance data is required, e.g., to improve reproducibility. Almost all scientific observations make heavy use of sampling strategies, and, therefore, the Sampling, Sampler, and Sample classes, as well as their corresponding properties, have been added to SOSA and SSN. Due to the increasing importance of the Web of Things and smart instrumentation and environments more generally, the classes Actuator and Actuation have been added to SOSA and SSN. The new SSN streamlines the relations (and need for) the old Device, Platform, and Systems classes. The old SSN was perceived as too heavyweight (on its axiomatization) and too dependent on OWL reasoning by some users. To strike a balance, DL expressivity of the new lightweight SOSA ontology is ALI(D) which is efficiently supported by modern triple stores, while the new SSN is ALRIN(D). In contrast, the old SSN is SRIQ. The SSN previously imported DUL and many SSN terms inherited from DUL terms. Due to frequent user requests, this has been redesigned so that SSN (and SOSA) can be used entirely independently of DUL if desired. Some of the alignments with DUL have been reconsidered. Those parts of SSN that use DUL terms have been separated into the SSN Alignment with DUL ontology. This alignment and therefore the role of DUL in SSN have been declared non-normative. The definitions for many classes and properties have changed slightly to improve explanation or to correct minor errors. Examples have been separated from the main definitions. The initial SSN has been criticized for its partially inconsistent handling of virtual sensors (including software and simulations) and related classes and properties. The new SSN and SOSA address this issue by allowing all major classes to be virtual, and to better support humans and other animals as agents. The notion of Procedure (formerly Plan) has been clarified to describe a workflow, protocol, plan, algorithm, or computational method specifying how to make an Observation, create a Sample, or make a change to the state of the world via an Actuator. The Observation class in the initial SSN was conceptualized as a subclass of the DUL Situation class. To improve alignment with O&M and user expectations, as well as to follow a consistent modeling strategy for observations, sampling, and actuation, the Observation class defined in SOSA and the new SSN are now conceptualized as activities. The initial SSN used local/guarded domain and range restrictions. The lightweight SOSA ontology uses an even more restrained axiomatization to foster wide reuse and adaptation among an audience that is not necessarily familiar with OWL. SOSA makes use of the domainIncludes and rangeIncludes annotation properties defined in Schema.org. These had not been available before. Given the increased interest in using Semantic Web technologies directly on the level of individual sensors, actuators, or platforms, SOSA's axiomatization does not use many of the more complex language elements introduced by SSN. This section introduces the specifications for SOSA and SSN. Several conceptual modules have been defined to cover key sensor, actuation and sampling concepts. The different conceptual modules of SOSA/SSN can be seen in the following figure. 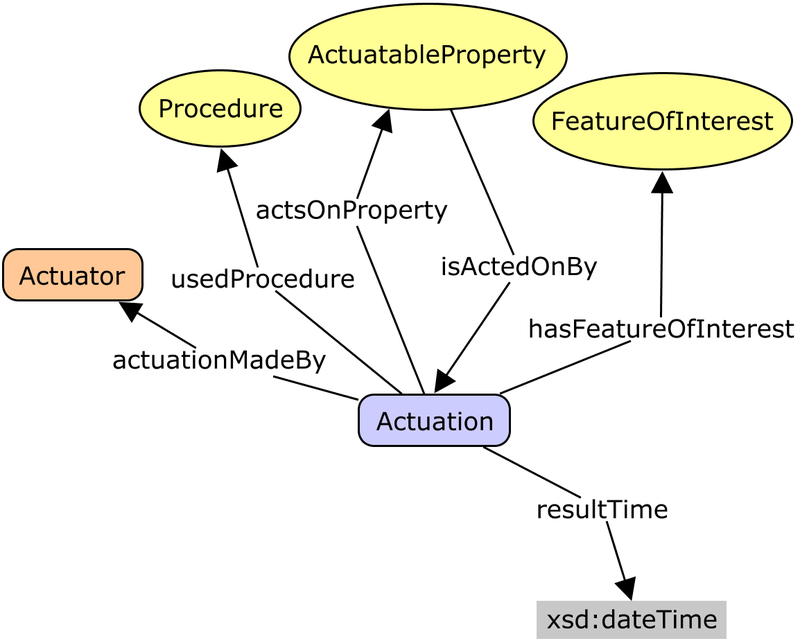 An overview of the main classes and properties inside the ontology modules can be seen in the following figures, from the perspectives of Observation, Actuation and Sampling. In the figures, and in the rest of the document, SOSA-related components and restrictions are shown in green, while SSN-only components are shown in blue. The following figure provides an overview of the core classes and properties that are specifically related to modeling Observations. SOSA axioms are shown in green, while SSN-only axioms are shown in blue. Observable Property - An observable quality (property, characteristic) of a FeatureOfInterest. The height of a tree, the depth of a water body, or the temperature of a surface are examples of observable properties, while the value of a classic car is not (directly) observable but asserted. Observation - Act of carrying out an (Observation) Procedure to estimate or calculate a value of a property of a FeatureOfInterest. 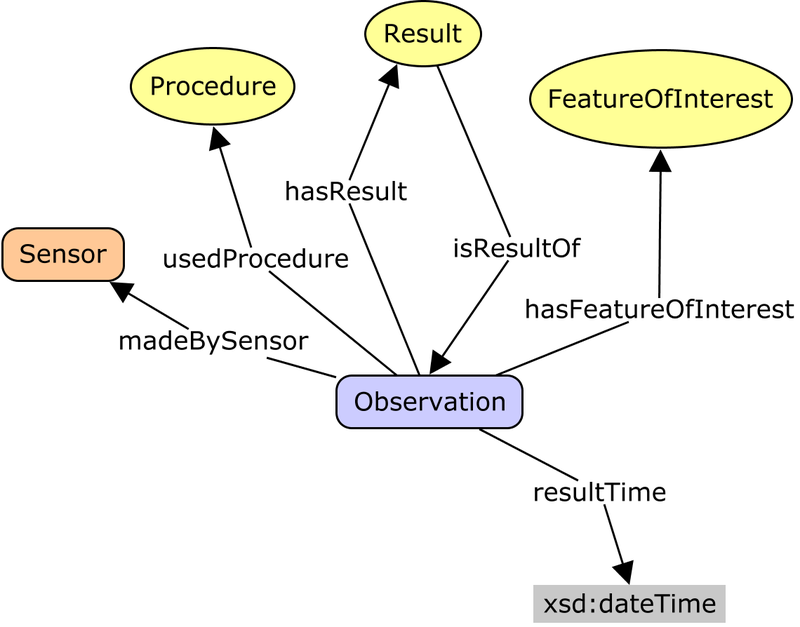 Links to a Sensor to describe what made the Observation and how; links to an ObservableProperty to describe what the result is an estimate of, and to a FeatureOfInterest to detail what that property was associated with. The activity of estimating the intensity of an Earthquake using the Mercalli intensity scale is an Observation as is measuring the moment magnitude, i.e., the energy released by said earthquake. observed property - Relation linking an Observation to the property that was observed. The ObservableProperty should be a property of the FeatureOfInterest (linked by hasFeatureOfInterest) of this Observation. phenomenon time - The time that the Result of an Observation, Actuation, or Sampling applies to the FeatureOfInterest. Not necessarily the same as the resultTime. May be an interval or an instant, or some other compound temporal entity [ owl-time ]. Sensor - Device, agent (including humans), or software (simulation) involved in, or implementing, a Procedure. Sensors respond to a Stimulus, e.g., a change in the environment, or Input data composed from the Results of prior Observations, and generate a Result. Sensors can be hosted by Platforms. Accelerometers, gyroscopes, barometers, magnetometers, and so forth are Sensors that are typically mounted on a modern smart phone (which acts as Platform). Other examples of Sensors include the human eyes. observes - Relation between a Sensor and an ObservableProperty that it is capable of sensing. is observed by - Relation between an ObservableProperty and the Sensor able to observe it. made observation - Relation between a Sensor and an Observation made by the Sensor. made by Sensor - Relation between an Observation and the Sensor which made the Observations. Stimulus - An event in the real world that 'triggers' the Sensor. The properties associated to the Stimulus may be different to the eventual observed ObservableProperty. It is the event, not the object, that triggers the Sensor. isProxyFor - A relation from a Stimulus to the Property that the Stimulus is serving as a proxy for. For example, the expansion of quicksilver is a Stimulus that serves as a proxy for some temperature Property. An increase or decrease in the velocity of spinning cups on a wind Sensor is serving as a proxy for the wind speed. was originated by - Relation between an Observation and the Stimulus that originated it. detects - A relation from a Sensor to the Stimulus that the Sensor detects. The Stimulus itself will be serving as a proxy (isProxyFor) for some ObservableProperty. The following figure provides an overview of the core classes and properties that are secifically related to modeling Actuations. SOSA axioms are shown in green, while SSN-only axioms are shown in blue. Actuatable Property - An actuatable quality (property, characteristic) of a FeatureOfInterest. A window actuator acts by changing the state between a frame and a window. The ability of the window to be opened and closed is its ActuatableProperty. Actuation - An Actuation carries out an (Actuation) Procedure to change the state of the world using an Actuator. The activity of automatically closing a window if the temperature in a room drops below 20 degree Celsius. The activity is the Actuation and the device that closes the window is the Actuator. The Procedure is the rule, plan, or specification that defines the Conditions that triggers the Actuation, here a drop in temperature. acts on property - Relation between an Actuation and the property of a FeatureOfInterest it is acting upon. In the activity (Actuation) of automatically closing a window if the temperature in a room drops below 20 degrees Celsius, the property on which the Actuator acts upon is the state of the window as it changes from being open to being closed. is acted on by - Relation between an ActuatableProperty of a FeatureOfInterest and an Actuation changing its state. Actuator - A device that is used by, or implements, an (Actuation) Procedure that changes the state of the world. A window actuator for automatic window control, i.e., opening or closing the window. made actuation - Relation between an Actuator and the Actuation made by the Actuator. made by actuator - Relation linking an Actuation to the Actuator that made that Actuation. The following figure provides an overview of the core classes and properties that are secifically related to modeling Samplings. SOSA axioms are shown in green, while SSN-only axioms are shown in blue. Sample - Feature which is intended to be representative of a FeatureOfInterest on which Observations may be made. Samples are typically subsets or extracts from the feature of interest of an observation. They are used in situations where observations cannot be made directly on the ultimate feature of interest, either because the entire feature cannot be observed, or because it is more convenient to use a proxy. Samples are thus artifacts of an observational strategy, and usually have no significant function outside of their role in the observation process. The characteristics of the samples themselves are generally of little interest, except to the manager of a sampling campaign, or sample curator. A Sample is intended to sample some FeatureOfInterest, so there is an expectation of at least one isSampleOf property. However, in some cases the identity, and even the exact type, of the sampled feature may not be known when observations are made using the sampling features. Physical samples are sometimes known as 'specimens'. A 'station' is essentially an identifiable locality where a Sensor system or procedure may be deployed and an observation made. In the context of the observation model, it connotes the 'world in the vicinity of the station', so the observed properties relate to the physical medium at the station, and not to any physical artifact such as a mooring, buoy, benchmark, monument, well, etc. A statistical sample is often designed to be characteristic of an entire population, so that Observations can be made regarding the sample that provide a good estimate of the properties of the population. has sample - Relation between a FeatureOfInterest and the Sample used to represent it. is sample of - Relation from a Sample to the FeatureOfInterest that it is intended to be representative of. Sampling - An act of Sampling carries out a (Sampling) Procedure to create or transform one or more Samples. Crushing a rock sample in a ball mill. Digging a pit through a soil sequence. Dividing a field site into quadrants. Drawing blood from a patient. Establishing a station for environmental monitoring. Registering an image of the landscape. Sieving a powder to separate the subset finer than 100-mesh. Selecting a subset of a population. Splitting a piece of drill-core to create two new samples. Taking a diamond-drill core from a rock outcrop. Sampler - A device that is used by, or implements, a (Sampling) Procedure to create or transform one or more samples. A ball mill, diamond drill, hammer, hypodermic syringe and needle, image Sensor or a soil auger can all act as sampling devices (i.e., be Samplers). However, sometimes the distinction between the Sampler and the Sensor is not evident, as they are packaged as a unit. A Sampler need not be a physical device. made sampling - Relation between a Sampler (sampling device or entity) and the Sampling act it performed. 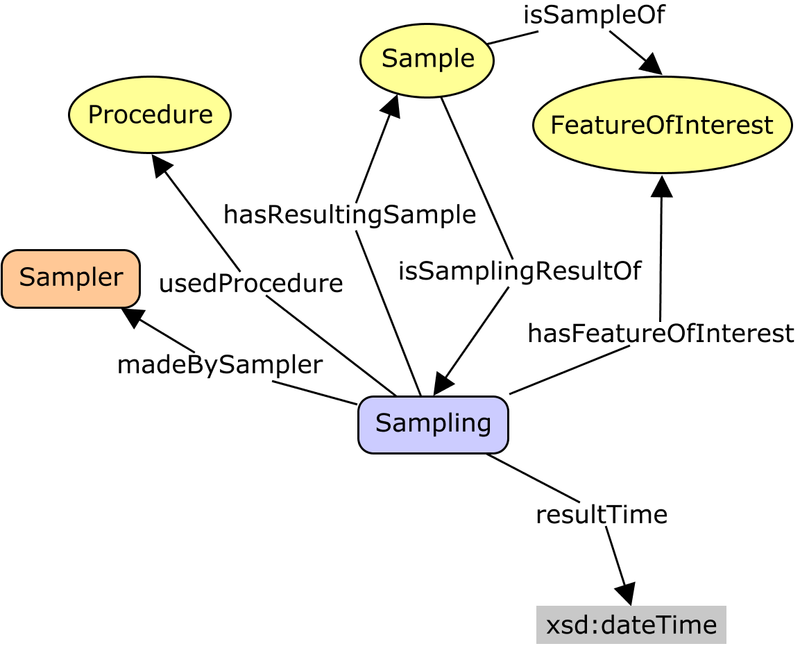 made by sampler - Relation linking an act of Sampling to the Sampler (sampling device or entity) that made it. The following figure provides an overview of the core classes and properties that are secifically related to modeling Features of Interest and Properties. SOSA axioms are shown in green, while SSN-only axioms are shown in blue. Feature Of Interest - The thing whose property is being estimated or calculated in the course of an Observation to arrive at a Result, or whose property is being manipulated by an Actuator, or which is being sampled or transformed in an act of Sampling. When measuring the height of a tree, the height is the observed ObservableProperty, 20m may be the Result of the Observation, and the tree is the FeatureOfInterest. A window is a FeatureOfInterest for an automatic window control Actuator. has feature of interest - A relation between an Observation and the entity whose quality was observed, or between an Actuation and the entity whose property was modified, or between an act of Sampling and the entity that was sampled. For example, in an Observation of the weight of a person, the FeatureOfInterest is the person and the property is its weight. is feature of interest of - A relation between a FeatureOfInterest and an Observation about it or an Actuation acting on it, or an act of Sampling that sampled it. Property - A quality of an entity. An aspect of an entity that is intrinsic to and cannot exist without the entity. has property - Relation between an entity and a Property of that entity. is property of - Relation between a Property and the entity it belongs to. for property - A relation between some aspect of an entity and a Property. For example, from a Sensor to the properties it can observe; from an Actuator to the properties it can act on; from a Deployment to the properties it was installed to observe or act on; from a SystemCapability to the Property the capability is described for. The following figure provides an overview of the core classes and properties that are secifically related to modeling Results. SOSA axioms are shown in green, while SSN-only axioms are shown in blue. Result - The Result of an Observation, Actuation, or act of Sampling. To store an observation's simple result value one can use the hasSimpleResult property. The value 20 as the height of a certain tree together with the unit, e.g., Meter. has result - Relation linking an Observation and a Sensor or Actuator and a Result, which contains a value representing the value associated with the observed Property. is result of - Relation linking a Result to the Observation or Actuation that created or caused it. has simple result - The simple value of an Observation or Actuation. For instance, the values 23 or true. result time - The result time is the instant of time when the Observation, Actuation or Sampling activity was completed. The following figure provides an overview of the core classes and properties that are secifically related to modeling Procedures. SOSA axioms are shown in green, while SSN-only axioms are shown in blue. Procedure - A workflow, protocol, plan, algorithm, or computational method specifying how to make an Observation, create a Sample, or make a change to the state of the world (via an Actuator). A Procedure is re-usable, and might be involved in many Observations, Samplings, or Actuations. It explains the steps to be carried out to arrive at reproducible Results. The measured wind speed differs depending on the height of the Sensor above the surface, e.g., due to friction. Consequently, procedures for measuring wind speed define a standard height for anemometers above ground, typically 10m for meteorological measures and 2m in Agrometeorology. This definition of height, Sensor placement, and so forth are defined by the Procedure. Many Observations may be created via the same Procedure, the same way as many tables are assembled using the same instructions (as information objects, not their concrete realization). used procedure - A relation to link to a re-usable Procedure used in making an Observation, an Actuation, or a Sample, typically through a Sensor, Actuator or Sampler. implements - Relation between an entity that implements a Procedure in some executable way and the Procedure (an algorithm, procedure or method). implemented by - Relation between a Procedure (an algorithm, procedure or method) and an entity that implements that Procedure in some executable way. has Input - Relation between a Procedure and an Input to it. Input - Any information that is provided to a Procedure for its use. has Output - Relation between a Procedure and an Output of it. Output - Any information that is reported from a Procedure. The following figure provides an overview of the core classes and properties that are secifically related to modeling systems and their deployment. SOSA axioms are shown in green, while SSN-only axioms are shown in blue. Platform - A Platform is an entity that hosts other entities, particularly Sensors, Actuators, Samplers, and other Platforms. A post, buoy, vehicle, ship, aircraft, satellite, cell-phone, human or animal may act as Platforms for (technical or biological) Sensors or Actuators. hosts - Relation between a Platform and a Sensor, Actuator, Sampler, or Platform, hosted or mounted on it. is hosted by - Relation between a Sensor, or Actuator, Sampler, or Platform, and the Platform that it is mounted on or hosted by. System - System is a unit of abstraction for pieces of infrastructure that implement Procedures. A System may have components, its subsystems, which are other Systems. has subsystem - Relation between a System and its component parts. Deployment - Describes the Deployment of one or more Systems for a particular purpose. Deployment may be done on a Platform. For example, a temperature Sensor deployed on a wall, or a whole network of Sensors deployed for an Observation campaign. deployed system - Relation between a Deployment and a deployed System. has deployment - Relation between a System and a Deployment, recording that the System is deployed in that Deployment. deployed on platform - Relation between a Deployment and the Platform on which the Systems are deployed. in deployment - Relation between a Platform and a Deployment, meaning that the deployedSystems of the Deployment are hosted on the Platform. For example, a relation between a buoy and a Deployment of several Sensors. This section provides details on the currently available horizontal segmentation modules. An ontology graph for this is available. The following figure provides an overview on the core classes and properties that are specifically related to modeling System capabilities, operating ranges, and survival ranges, under given conditions. in condition - Describes the prevailing environmental Conditions for SystemCapabilites, OperatingRanges and SurvivalRanges. Used for example to say that a Sensor has a particular accuracy in particular Conditions. Condition - Used to specify ranges for qualities that act as Conditions on a Systems' operation. For example, wind speed of 10-60m/s may be used as the Condition on a SystemProperty, for example, to state that a Sensor has a particular Accuracy under that Condition. has system capability - Relation from a System to a SystemCapability describing the capabilities of the System under certain Conditions. System Capability - Describes normal measurement, actuation, sampling properties such as accuracy, range, precision, etc. of a System under some specified Conditions such as a temperature range. The capabilities specified here are those that affect the primary purpose of the System, while those in OperatingRange represent the system's normal operating environment, including Conditions that don't affect the Observations or the Actuations. has system property - Relation from an SystemCapability of a System to a SystemProperty describing the capabilities of the System. System Property - An identifiable and observable characteristic that represents the System's ability to operate its primary purpose: a Sensor to make Observations, an Actuator to make Actuations, or a Sampler to make Sampling. Measurement Range - The set of values that the Sensor can return as the Result of an Observation under the defined Conditions with the defined system properties. Actuation Range - The range of Property values that can be the Result of an Actuation under the defined Conditions. Accuracy - The closeness of agreement between the Result of an Observation (resp. the command of an Actuation) and the true value of the observed ObservableProperty (resp. of the acted on ActuatableProperty) under the defined Conditions. Detection Limit - An observed value for which the probability of falsely claiming the absence of a component in a material is beta, given a probability alpha of falsely claiming its presence. Drift - As a Sensor Property: a continuous or incremental change in the reported values of Observations over time for an unchanging Property under the defined Conditions. As an Actuator Property: a continuous or incremental change in the true value of the acted on ActuatableProperty over time for an unchanging command under the defined Conditions. Frequency - The smallest possible time between one Observation, Actuation, or Sampling and the next, under the defined Conditions. Latency - The time between a command for an Observation (resp. Actuation) and the Sensor providing a Result (resp. the Actuator operating the Actuation), under the defined Conditions. Precision - As a sensor capability: The closeness of agreement between replicate Observations on an unchanged or similar quality value: i.e., a measure of a Sensor's ability to consistently reproduce an Observation, under the defined Conditions. As an actuator capability: The closeness of agreement between replicate Actuations for an unchanged or similar command: i.e., a measure of an Actuator's ability to consistently reproduce an Actuations, under the defined Conditions. Resolution - As a Sensor Property: the smallest difference in the value of a ObservableProperty being observed that would result in perceptably different values of Observation Results, under the defined Conditions. As an Actuator Property: the smallest difference in the value of an Actuation command that would result in a value change of the ActuatableProperty being acted on, under the defined Conditions. Response time - As a Sensor Property: the time between a (step) change in the value of an observed ObservableProperty and a Sensor (possibly with specified error) 'settling' on an observed value, under the defined Conditions. As an Actuator Property: the time between a (step) change in the command of an Actuator and the 'settling' of the value of the acted on ActuatableProperty, under the defined Conditions. Selectivity - As a Sensor Property: Selectivity is a Property of a Sensor whereby it provides observed values for one or more ObservableProperties such that the Result for each ObservableProperty are independent of other Properties in the FeatureOfInterest being investigated, under the defined Conditions. As an Actuator Property: Selectivity is a Property of an Actuator whereby it acts on one or more ActuatableProperties such as the Results for each ActuatableProperty are independent of other Properties in the FeatureOfInterest being acted on, under the defined Conditions. Sensitivity - As a Sensor Property: Sensitivity is the quotient of the change in a Result of Observations and the corresponding change in a value of an ObservableProperty being observed, under the defined Conditions. As an Actuator Property: Sensitivity is the quotient of the change in a command of Actuation and the corresponding change in a value of an ActuatableProperty being acted on, under the defined Conditions. has operating range - Relation from a System to an OperatingRange describing the normal operating environment of the System. Operating Range - Describes normal OperatingProperties of a System under some specified Conditions. For example, to the power requirement or maintenance schedule of a System under a specified temperature range. In the absence of OperatingProperties, it simply describes the Conditions in which a System is expected to operate. The System continues to operate as defined using SystemCapability. If, however, the OperatingProperty is violated, the System is operating 'out of operating range' and SystemCapability specifications may no longer hold. has operating property - Relation from an OperatingRange of a System to an OperatingProperty describing the operating range of the System. Operating Property - An identifiable characteristic that represents how the System operates under the specified Conditions. May describe power ranges, power sources, standard configurations, attachments and the like. Maintenance Schedule - Schedule of maintenance for a System in the specified Conditions. Operating Power Range - Power range in which System is expected to operate in the specified Conditions. has survival range - Relation from a System to a SurvivalRange. Survival Range - Describes SurvivalProperties of a System under some specified Conditions. For example, the lifetime of a System under a specified temperature range. In the absence of SurvivalProperties, simply describes the Conditions a System can be exposed to without damage. For example, the temperature range a System can withstand before being considered damaged. The System continues to operate as defined using SystemCapability. If, however, the SurvivalRange is violated, the System is 'damaged' and SystemCapability specifications may no longer hold. 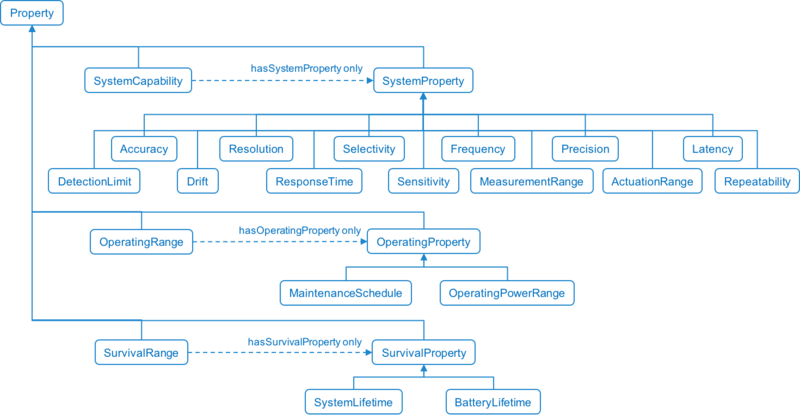 has survival property - Relation from a SurvivalRange of a System to a SurvivalProperty describing the survival range of the System. Survival Property - An identifiable characteristic that represents the extent of the System's useful life under the specified Conditions. May describe for example total battery life or number of recharges, or, for Sensors that are used only a fixed number of times, the number of Observations that can be made before the sensing capability is depleted. System Lifetime - Total useful life of a System (expressed as total life since manufacture, time in use, number of operations, etc.) in the specified Conditions. Battery Lifetime - Total useful life of a System's battery in the specified Conditions. quality of observation - Relation linking an Observation to the adjudged quality of the Result. This is complementary to the SystemCapability information recorded for the Sensor that made the Observation. Samples are often related to other samples, by sub-sampling, topological relationships (stations along a traverse, pixels within an image, probe spots on a polished section, specimens retrieved within a borehole) or as parts of sample processing chains (crushing, splitting, dissecting, disolving). There are an essentially unlimited set of relationships between samples, so the nature of the relationship has its own class. This section describes a flexible model to describe such relationships between samples. The model is based on the QualifiedRelation pattern. The following figure provides an overview on the classes and properties that are specifically related to modeling Sample relationships. Nature of relationship (between samples) - Members of this class indicate the nature of a relationship between two Samples. Sample relationship - Members of this class represent a relationship between a Sample and another. has sample relationship - Links a sample to a Sample Relationship (which links to a related Sample). nature of (sample) relationship - Links a Sample Relationship to an indication of the nature of the relationship. related sample - Links a Sample Relationship to the related Sample. This section introduces the specifications for the vertical segmentation modules that align SOSA and SSN to a variety of related ontologies and specifications. This section introduces the alignment of SSN to the DOLCE UltraLite upper ontology (DUL) which is the core dependency of the previous version of SSN. This serves to axiomatically clarify the intended meaning of SSN terms and will assist SSN users wishing to interoperate with other DUL-aligned ontologies. It is also imported in the SSNX alignment module that aligns SSN to the previous version of SSN. Note, however, that the DUL alignment can be used independently to align SSN with more generic concepts/properties of DUL. The DUL alignment, known as "ssn-dul" is available at http://www.w3.org/ns/ssn/dul. The following classes in SOSA and SSN can be aligned via a subclass relation as follows. For more complex alignments, the axiomatic alignments are defined as follows. Additional alignments from SOSA/SSN to DUL properties are defined as follows. This section formally relates the SSN ontology to the previous version of SSN that was published by the SSN-XG ("old SSN"). This may be useful for backward-compatibility and transition purposes. While the namespaces for SSN and DUL have changed since the SSN-XG first published the old SSN, the SSN alignment, known as "SSN-SSNX" is available at http://www.w3.org/2017/01/ssn-ssnx/. Note that SSN-SSNX imports SSN-DUL. The primary classes from SSN-XG have direct equivalent classes in SOSA and SSN as shown below. The following classes in SOSA and SSN are interpreted as superclasses of the corresponding ones in SSN-XG. The more complex aligments of SSN-XG classes are expressed as combinations of axiomatic statements as follows. The following properties from SSN-XG have direct equivalent properties in SOSA and SSN. Additional alignments from SSG-XG properties to SOSA and SSN are defined as follows. The more complicated alignments are presented in combination with the property-chain axioms as follows. This section introduces the alignment of SOSA/SSN to OGC Observations and Measurements [ OandM ] (also known as ISO 19156:2011). The XML implementation of O&M [ OMXML ] is used for the payload for Sensor Observation Services, of which there are many operational deployments. Integration of these with observation data formalized using SOSA and SSN is highly desirable, and would be expected to significantly enrich the set of resources represented using SOSA/SSN. The alignment presented here provides a basis for transforming OM-XML data into RDF resources or OWL individuals according to the SOSA/SSN ontologies. O&M is specified as a UML model, following the patterns specified in ISO 19109 Geographic Information - Rules for Application Schema [ ISO-19109 ]. This means that the classes represent concepts from the application domain, so can be approximately equated with classes in an ontology. An OWL implementation of O&M may be generated by explicit translation of the UML following rules specified in [ ISO-19150-2 ] - see [ OM-Heavy ]. This translation generates an RDF entity denoted by a URI for every class, class attribute, and association-role from the original O&M UML model. The form of the URIs is also specified in [ ISO-19150-2 ], and appear explicitly in the official OWL implementation of ISO 19156 (O&M) maintained by the ISO/TC 211 Group on Ontology Management. These URIs are therefore convenient identifiers for elements of the O&M in a formal alignment. The explicit translation from the UML model comes at the cost of a large set of dependencies on similar OWL translations of other UML models from the ISO 19100 series standards. 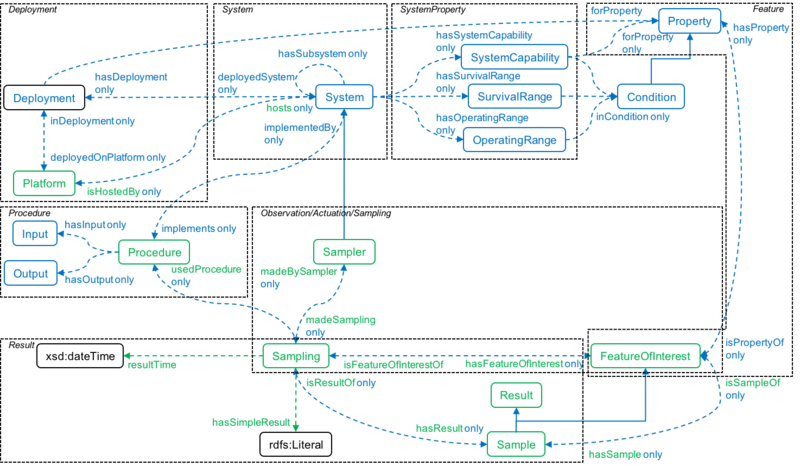 Furthermore, the ontology structure reflects artefacts of the UML-style of modeling. This implementation may introduce entailments that are inconsistent with SOSA/SSN (though no inconsistencies have been identified yet) so it is important to understand that use of these URIs here are principally intended to denote the original UML classes and properties, rather than this OWL implementation. NOTE: In response to the complexity of the explicit translation, a handcrafted version in more idiomatic OWL, without the dependencies, is also available [ OM-Lite ]. NOTE: At time of writing, the ISO-specified URIs do not de-reference. However, ISO/TC 211 are currently developing a publication system to enable this and thus the use of these URIs as Linked Data. The following namespace prefixes are used in the alignment to SOSA. Three utility classes are defined locally to support the formalization of the alignment. The primary classes from [ OandM ] have direct equivalents in SOSA classes supplemented by the utility classes described above, as follows. Additional alignments from SOSA/SSN classes to O&M classes are as follows. iso19156_sp:PreparationStep is a subclass since the act of Sampling applies to all sample types, not only physical specimens. The class GFI_DomainFeature represents 'real-world' features which are the ultimate subject of an observation campaign, i.e. the features from an application domain that are not artefacts of the observation process (sampling features). sosa:FeatureOfInterest is a subclass of iso19156_gfi:GFI_DomainFeature since not all domain features are subjects of observation. The class GFI_Feature represents the set of all classes which are feature types. In an implementation this abstract class shall be substituted by a concrete class representing a feature type from an application schema associated with a domain of discourse (ISO 19109, ISO 19101). The following properties from [ OandM ] have direct equivalents in SOSA properties. Additional alignments from O&M properties to SOSA are as follows. These are modeled as sub-properties because sosa:usedProcedure, sosa:hasResult, sosa:isResultOf and sosa:resultTime applies to actuation, observation or sampling activities. This is modeled as a sub-property because the domain of iso19156-sfs:SF_SpatialSamplingFeature.hostedProcedure is a spatial sampling feature, such as a station, rather than a more general platform. An RDF file containing a graph corresponding to this alignment is available. This section introduces the alignment of SOSA to OBOE. 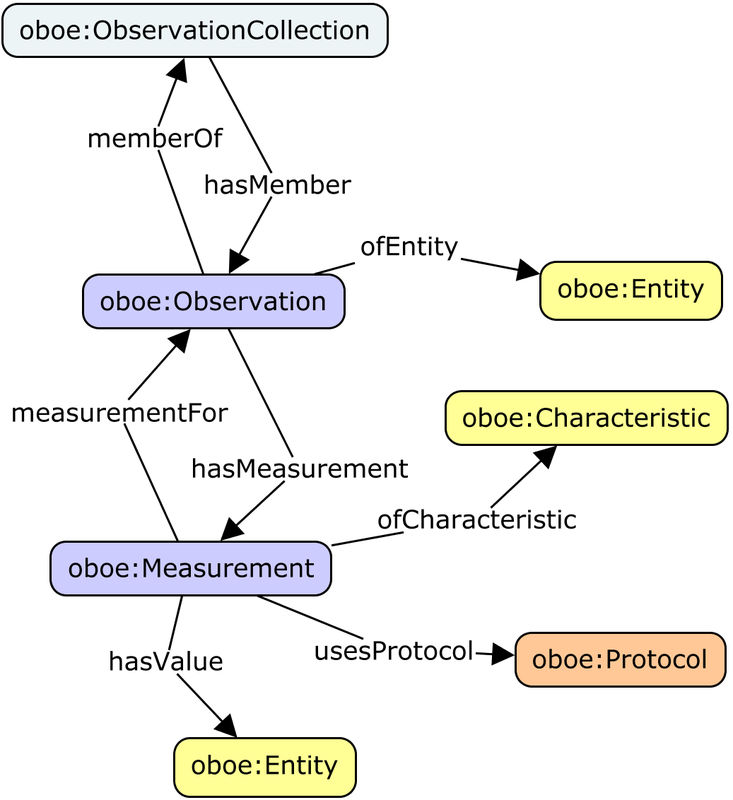 OBOE, the Extensible Observation Ontology, is used within the biodiversity community for semantic representation of observation data. The ontology is composed of multiple modules. The core observation elements are in the module OBOE-core. An oboe:Observation is composed of a collection of oboe:Measurements with the same feature of interest. Each oboe:Measurement concerns a distinct observed-property ("characteristic") and uses a distinct procedure ("protocol"). We therefore choose to align sosa:Observation with oboe:Measurement. Figure 22 Core classes from OBOE alongside the SOSA observation model. The primary classes from [ OBOE ] are aligned with SOSA classes as follows. The class oboe:Entity appears in OBOE as the range of the oboe:ofEntity and oboe:hasValue properties, so we interpret it as a general superclass. The following properties from [ OBOE ] may be directly aligned with SOSA properties. oboe:hasValue, oboe:usesProtocol and oboe:usesMethod are sub-properties of the corresponding SOSA properties which apply to actuation and sampling as well as observation. The feature of interest is linked to the oboe:Observation that contains a oboe:Measurement, rather than to the oboe:Measurement directly, so a property-chain axiom is required to express the alignment. The properties oboe:hasMeasurement and its inverse oboe:measurementFor link an oboe:Observation to its member oboe:Measurements. These could be modeled as sub-properties related to rdfs:member and its inverse as follows. This section introduces the alignment of SOSA to W3C PROV ([ prov-overview ], [ prov-dm ], [ prov-o ]). The underlying structure of PROV is based around a process-flow model, with three base classes: Entity, which is the class of physical, digital, conceptual, or other kinds of things with some fixed aspects; Activity, which is the class of things that occur over a period of time and act upon or with entities, and it may include consuming, processing, transforming, modifying, relocating, using, or generating entities; and Agent, the class of things that bear some form of responsibility for an activity taking place, for the existence of an entity, or for another agent's activity. Figure 23 Core PROV classes and some of the properties that relate them, shown alongside the core SOSA structure for observation, actuation and sampling. Classes generally aligned with prov:Entity in yellow ellipses; with prov:Activity in purple boxes; with prov:Agent in orange boxes. The SOSA/SSN ontologies conceive observations, actuations, and acts of sampling as activities or events, that results in information being produced, or a change in the world, or the production or transformation of a sample. Thus, an alignment of SOSA to PROV is natural. Compton et al. [ SSN-PROV ] and Cox [ OM-Lite ] have previously described alignments of the SSNX and O&M models with [ prov-o ]. The alignment here is based on that work, also extended to consider actuation. The following namespace prefixes are used in the alignment of SOSA to PROV. The primary classes from SOSA are aligned with the PROV classes as follows. This section informally discusses how to handle common modeling questions such as locations, forecasts, and quantity values with a unit of measure. Many of the key classes provided by SOSA and SSN represent entities that can be located in space such as sensors, features of interest, actuators, samples, and so forth, or activities that can be located via their participating entities, e.g., platforms. These entities will usually be described using models and ontologies defined for application domains, including technical disciplines, social and business contexts. In these contexts there are a number of implementations that support the expression of spatial properties, including location. These are discussed further in the Spatial Data on the Web Best Practices note [ SDW-BP ]. In particular, GeoSPARQL [ GeoSPARQL ] provides a flexible and relatively complete platform for geospatial objects, that fosters interoperability between geo-datasets. To do so, these entities can be declared as instances of geo:Feature and geometries can be assigned to them via the geo:hasGeometry property. In case of classes, e.g., specific features of interests such as rivers, these can be defined as subclasses of geo:Feature. One may also represent forecasts as observations if the value of sosa:phenomenonTime is later in time than the sosa:resultTime. Given the definition of these terms, it means that: The time when the Observation act was completed is before the time that the Result of the observation applies to the FeatureOfInterest. Other means to represent forecasts are reported, but not in the scope of this specification. For example [ Lefrancois-et-al-2017 ] derives the SSN Sensing/Sensor/Observation pattern and define Forecasting/Forecaster/Forecast classes. Describing a plan for some actuation or observation in the future is not covered by this specification. The result of an sosa:Observation or an sosa:Actuation can be a quantity value with a numeric value and a unit of measure. It is not in the scope of this specification to recommend any particular way of modeling results as quantity values. There exists external vocabularies that are specifically designed for modeling quantity values as OWL individuals. Examples include the Quantities, Units, Dimensions and Data Types Ontologies (QUDT, [ QUDT ]) and the Ontology of Units of Measure (OM, [ Rijgersberg-et-al-2013 ]). With QUDT 1.1, a sosa:Result would be a qudt:QuantityValue. With OM 2, a sosa:Result would be a om:Measure or om:Point. Other means to represent quantity values as literals are reported, but not in the scope of this specification. This solution would require the use of some custom datatype whose value space is some set of quantity values. Such a datatype should be supported by RDF and SPARQL engines to support the comparison of quantity values. On the other hand, this approach is not compatible with the OWL specifications, that restrict the set of datatypes that can be used. See sec. 5.2 in [ owl2-syntax ] for more details. This specification does not specify whether an instance of ssn:Property should be generic to all features of interest (e.g., ex:Temperature, ex:OnOffStatus), or specific to a single feature of interest (e.g., <myBodyTemperature>, <LightStatus>). Implementers are free to choose one way of modeling things or the other. On the other hand, one SHOULD NOT use OWL punning to make ex:Temperature denote both a subclass of ssn:Property and an instance of ssn:Property. In fact, merging the two examples below in a single RDF Graph would make an OWL reasoner infer that ex:Temperature, <office/1/temperature>, and <office/2/temperature>, denote the same individual. This also holds for subclasses of ssn:Property: sosa:ObservableProperty, and sosa:ActuatableProperty. <office/1/temperature> a ex:Temperature , ssn:Property . <office/2/temperature> a ex:Temperature , ssn:Property . This specification does not specify whether an instance of ssn:System should be generic (e.g., ex:TemperatureSensor, ex:LightActuator), or specific to a single feature of interest (e.g., <temperatureSensor/84>, <light/112>). Implementers are free to choose one way of modeling things or the other. On the other hand, one SHOULD NOT use OWL punning to make ex:Temperature denote both a subclass of ssn:Property and an instance of ssn:Property. In fact, merging the two examples below in a single RDF Graph would make an OWL reasoner infer that ex:TemperatureSensor, <TemperatureSensor/1>, and <TemperatureSensor/2>, denote the same individual. This also holds for subclasses of ssn:System: sosa:Sensor, sosa:Actuator, and sosa:Sampler. ssn-system:inCondition ex:NormalTemperatureCondition , ex:NormalHumidityCondition . <TemperatureSensor/1> a ex:TemperatureSensor , ssn:System . <TemperatureSensor/2> a ex:TemperatureSensor , ssn:System . ssn-system:inCondition <modeSpecificTemperatureCondition> , <modeSpecificHumidityCondition> . Results of the wide review of SOSA and SSN is summarized here. An RDF file containing a graph corresponding to this example is available. # observed on June 6 2017 using only the SOSA core for modelling. rdfs:label "Atmosphere of Earth"@en . # among others the Bosch Sensortec BMP282 atmospheric pressure sensor. # An observation made by the BMP282 atmospheric pressure sensor. # and the Time Ontology for the instant. rdfs:label "Coal Oil Point Reserve"@en . rdfs:comment "Instructions for measuring relative humidity"@en . # observed by sensor #926. The result was available 12 seconds later. # it made some observations. sosa:madeObservation <Observation/235714>, <Observation/235715>, <Observation/235716> . # that it made some observations. sosa:madeObservation <tempSensor/23/4572>, <tempSensor/23/4573>, <tempSensor/23/4574> . # Sensor #926 made observations identified by <Observation/235714> and <Observation/235715>. # This is equivalent to saying that these observations have been made by sensor #926. # the window opening state is an ActuatableProperty. # SSN allows to explicitly say that <windowCloser/987> is designed to automatically open and close window #104. # Actuation #188 acted on the state of window #104 and returned 'true'. # to observe the height of tree #124 and #125.
rdfs:comment "rangefinder #30 is a laser range finder sensor."@en . # rangefinder #30 made observation #1087 of the height of tree #124. # using SSN, one can explicitly link a property and its feature of interest. # rangefinder #30 made observation #1088 of the height of tree #125.
rdfs:label "the height of tree #124"@en . rdfs:label "the height of tree #125"@en . # using SSN one can explicitly state that <VCAB-DP1-BP-40#groundDisplacementSpeed> is the property of <VCAB-DP1-BP-40#location> . # after the phenomenon time, due to the light travel duration. # at the location of the wind sensor. # observations #147 and #148.
ssn:detects <observation/147#spinningCupsMovement> , <observation/148#spinningCupsMovement> . # observation #147 was originated by the movement of the spinning cups of sensor #14. # the result of observations #147 and #148 is using some custom datatype that encodes the unit of measure. # wind sensor #14 made observations #147 and #148.
sosa:madeObservation <observation/147> , <observation/148> . In order to characterize a thing with a large extent, or which is not directly accessible, the usual observational strategy is to obtain one or more samples. Observations may then be made more conveniently on the samples, with the intention of characterizing the larger thing. This intentionality is captured using the property sosa:isSampleOf. In the following example, the ice core is a sample of the Antarctic ice sheet, and observations are made on the ice core. A convenient side effect of this feature is that all observations related to the larger thing (the ice sheet) can be found, and then potentially joined together in a meta-analysis in order to characterize that. # The CO2 level observed in an ice core is 240 parts per million. # the ice core is a sample of the polar ice sheet of Antarctica. sosa:hasSample <iceCore/12>, <iceCore/13>, <iceCore/14> . # using SSN one can explicitly state that <iceCore/12#CO2> is the property of <iceCore/12> . ssn-system:inCondition <NormalTemperatureCondition> , <NormalHumidityCondition> . ssn-system:hasSystemProperty <DHT22/4578#TemperatureSensorAccuracy> , <DHT22/4578#TemperatureSensorSensitivity> , <DHT22/4578#TemperatureSensorRepeatability> , <DHT22/4578#TemperatureSensorFrequency> . # one may use some other ontology to further qualify this quality. rdfs:comment """Tom gave a confidence value of 6 out of 10 on this observation."""@en . # one may use some quantity ontology. rdfs:comment "The embedded temperature sensor, a specific instance of temperature sensor."@en . This example shows how the conditions (temperature and humidity) in a room may be measured using one or more sensors. Each sensor observes the conditions in its immediate vicinity, and the values are then used to characterize the room. In Room 145 one of the walls is external in the building, so there is expected to be a temperature gradient across the room, and there are two sensors on different walls. In room 245 there is one sensor on the south wall. Each of these locations corresponds to a sosa:Sample of the entire room. The wall also serves as a sosa:Platform on which the sensors are mounted. ssn:forProperty <Room245#temperature> , <Room245#humidity> . ssn:forProperty <Room145#temperature> , <Room145#humidity> . This example describes the IP68 Smart Sensor that and some of its capabilities and operating ranges. A specific IP68 Smart Sensor observes the air temperature, and its own battery state. An XML implementation of the Observations and Measurements specification is available from OGC [ OandM ], known as [ OMXML ]. Annex C in that document contains a large set of examples. To assist users of O&M to understand SOSA/SSN, and potentially to migrate services based on OMXML to SOSA/SSN, an RDF file containing a graph corresponding to the OMXML examples is provided. 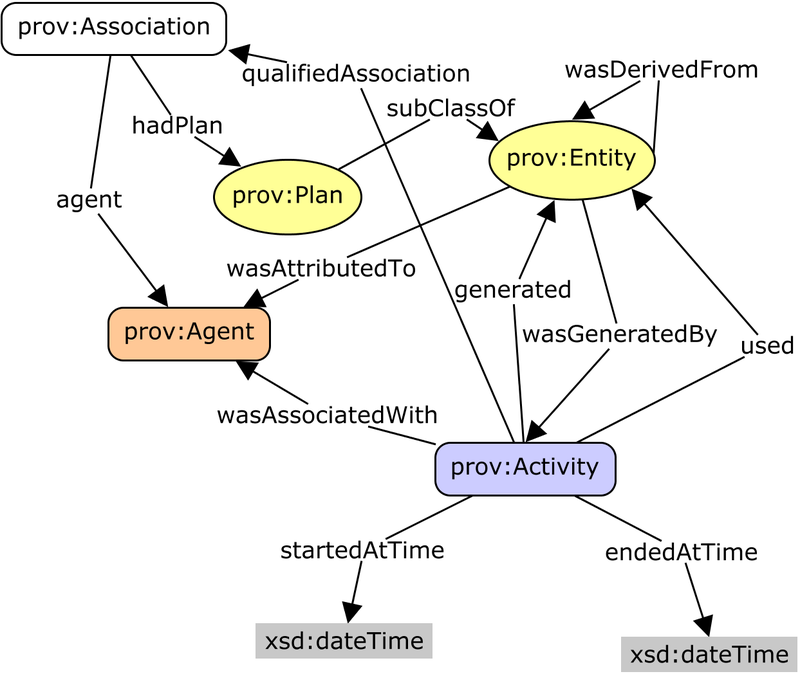 Note that in some cases the information contained in the OMXML examples goes beyond what is supported directly by SOSA/SSN, so the examples use terms from some other well known RDF vocabularies, such as [ GeoSPARQL ], [ QUDT ], [ owl-time ], and [ prov-o ], as well as the sample relations module. In some cases these only approximate the semantics of the OMXML examples. This is indicated in editorial notes embedded in the RDF file. In a few places where there was no well-known RDF implementation matching the requirements, the details have been omitted. The Editors recognize the major contribution of the members of the original W3C Semantic Sensor Networks Incubator Group. The editors also gratefully acknowledge the contributions made to this document by all members of the SSN subgroup of the Spatial Data on the Web working group. A full change-log is available on GitHub. The DUL ontology, that was imported in SSN, is no longer imported and all axioms using terms from DUL have been removed from SSN and collected in the DUL-SSN alignment module. The namespace was changed to match the planned namespace for this publication. The modularization as presented here, including the core, is entirely new. Correction to include some SSN terms that were unintentionally dropped from the FPWD. Correction to remove an asserted subclass of owl:Thing that was introduced into FPWD (these were both by-products of the DUL removal). Correction to some https namespace usage that crept into the FPWD. Transition to the new namespace used by the DUL module. Inclusion of the DUL alignment and the old SSN (of the SSN-XG) alignment. ssn:Sensor has been changed to be a subclass of dul:Object instead of dul:Physical Object. Various typography and spelling errors and consistency of expression in annotation properties have been improved. These do not induce any changes in the intended meaning of the terms. Specgen 6 has been used to generate the ontology documentation. The popular sketch of SSN structure has been removed. Object properties ssn:isValueOf, ssn:produces and ssn:featureInObservation, along with a propertychain subproperty of produces and another propertychain subproperty of hasProperty, were introduced unintentionally in the FPWD. Added "sosa:hasResult meta:domainIncludes sosa:Actuation" and "sosa:isResultOf meta:rangeIncludes sosa:Actuation"
Import sosa: "ssn: a owl:Ontology ; owl:imports sosa:."